It's tough to be America's friend right now -- but life is good for US adversaries. Diplomatic tensions and an escalating trade war mean that President Donald Trump can expect a chilly reception and awkward body language from allied leaders at the weekend's G-7 summit in Canada -- which some have dubbed the G1+6. And Trump's feuds with Washington's traditional partners are sure to test his promise that his "America First" ideology does not mean America alone. Yet as soon as the summit wraps up, Trump will jet off to what remarkably is likely to be a much warmer affair: a historic encounter in Singapore with one of the world's most notorious strongmen, North Korea's Kim Jong Un, the leader of a nation still technically at war with the United States. Kim will join a stable of autocrats, including Russia's Vladimir Putin and China's Xi Jinping, who have earned Trump's gushing praise -- to the consternation of some of America's oldest friends. At times, it seems American foreign policy has been turned upside down. America's relations with major allies lurched into crisis over steel and aluminum tariffs imposed by the Trump White House on Canada, Mexico and the European Union. The move appalled friendly governments because it was justified by the rationale that their trade policies presented a national security threat to the US. These are nations that shed blood alongside America in the post-9/11 wars in Afghanistan and Iraq and stood alongside the United States during the dark, threatening years of the Cold War. "I would just say to all of Canada's American friends -- and there are so many -- seriously? Do you really believe that Canada, that your NATO allies, represent a national security threat to you?" Canadian Foreign Minister Chrystia Freeland said on CNN's "State of the Union" on Sunday. "This is a really sad time for us. We are hurt, and we are insulted," she said. The contrast between America's allies and adversaries is especially stark because Trump, at the request of Xi, has been working to revive Chinese tech giant ZTE. The firm was threatened with extinction because of severe US sanctions imposed after ZTE infringed US restrictions on trade with Iran and North Korea. Like America's friends, the Chinese company, which critics fear is a vehicle for Chinese intelligence, was accused of endangering US national security. But the current ill feeling is not just about trade. America's European allies are furious Trump ignored their pleas to stay in the Iran nuclear deal and that he pulled out of the Paris climate pact. Canada is locked in a bitter renegotiation of the North American Free Trade Agreement initiated by Trump. America's friends resent the idea that issues they see as critical to their security are being dictated by Trump's perception of his own political interests. The divide is also philosophical: Trump's weakness for strongmen and disdain for multilateral diplomacy cuts against the liberal international principles of the West. The showdown marks a test of how Trump's approach -- a transactional view of foreign policy often based on whether the US is "winning" or being ripped off by its friends -- will shape the international order in the years ahead and ultimately American global leadership. The President's top economic adviser, Larry Kudlow, sought to play down the schism with US allies that will be obvious in Canada. "We're talking everything through. There may be disagreements. I regard this as much like a family quarrel," Kudlow said, but made no effort to downplay Trump's determination to stick to his guns on trade. The idea of a family squabble may be understating things. 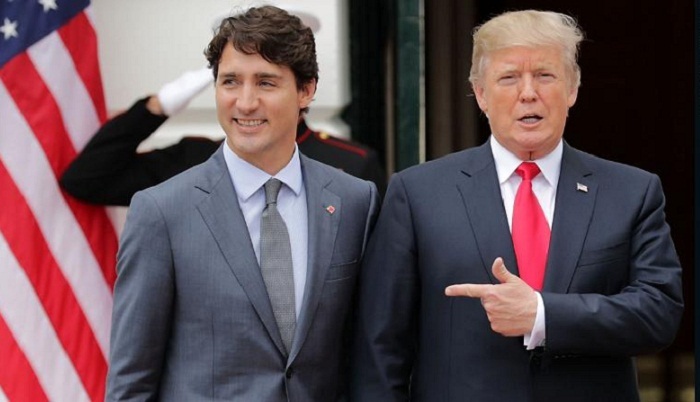 CNN reported Wednesday that Trump and Canadian Prime Minister Justin Trudeau had a testy call over tariffs last month. When Trudeau complained about the national security argument, the US leader quipped that Canada had once burned down the White House. The incident actually happened during the War of 1812, when Canada was a British colony. Trump's bromance with French President Emmanuel Macron is on the rocks after pair shared hugs and kisses during a state visit in Washington less than two months ago. Trump also had an awkward call with British Prime Minister Theresa May. His long-delayed visit to the UK, scheduled for next month, is expected to incite widespread protests. German Chancellor Angela Merkel, who has long sparred with Trump and believes his nationalistic approach spurns Western values, is warning of a "contentious" G-7 summit. "Where is the sort of balance of power going between people who threaten the United States and people who have been traditional allies?" asked CNN national security analyst Phil Mudd. Trump typically responds better to leaders who flatter him than to those who lecture him. But the President, a savvy political operator, knows images of a showdown with foreign prime ministers and presidents may not be all bad news. It's long been obvious that the motivating factor of Trump's foreign policy is a desire to honor promises he made to voters, who, for instance, embraced his disdain for the Iran deal and for fighting global warming. His conception of US interests is therefore more parochial and domestic than it has been for more internationalist presidents. Trump may be betting that the voters he needs to show up in droves in the midterm elections in November will interpret his international spats as proof that he is fighting for their interests. He also has one very strong card: the equal lowest unemployment rate in the US for nearly half a century and an economy that is on a growth spurt that will allow him to argue to other world leaders that his policies are being vindicated. "This President has the backbone to take the fight, and he will continue to take the fight," Kudlow said. But Trump's triumphalism will do little to improve relations between Europe and the United States, which are now more challenged than they were during the acrimony over the invasion of Iraq in 2003, which many European states opposed. Back then, there was never the sense that President George W. Bush was suspicious of the instruments of Western power -- like NATO and the EU. The same could not be said for Trump. And every time America's alliances are under strain, it's good news for its adversaries -- including Russia and China. One of Putin's long-term goals is to weaken the cohesion of the West, a process being accelerated by the current tensions. Trump's withdrawal from the Trans-Pacific Partnership deal and dismissal of the World Trade Organization as an arbiter of trade disputes helps Beijing's campaign against international arrangements that implement a pro-Western framework of rules-based commerce. The grave consequences of America's fallout with allies are one reason why eventually all sides might step back from the brink. Though trade and political disputes are raging, there is no sign yet of a loosening of the security and intelligence relationships that underpin Western security. Defense Secretary James Mattis admitted Wednesday that things might get "rocky" but downplayed the prospect of long-term damage. "Will the trade war have an impact, effect on the security relationships? Right now, I don't see that," Mattis said in Brussels. Another factor in favor of alliance cohesion is that each side needs the other to ensure common prosperity and security. Macron is attempting to revive France as a global power -- but cannot do so without its alignments with Washington, including counterterrorism cooperation. Britain, as it prepares to leave the EU, needs Trump's help in concluding a bilateral trade deal with the United States. And Canadian prosperity ultimately hinges on a new NAFTA deal with the US and Mexico. So while foreign leaders may not like Trump and despair of his methods, they are stuck with him as long as he's President.